Camp Commander, circa 1944 (Jim Sleeper Collection, UC Irvine Special Collections. Irvine Park/Camp Rathke. In November 1942 the Army took control of Irvine Park where they held training operations until April 1943. They then moved their facilities just west of the park and established Camp Rathke, named for Lt. George Rathke of Orange, who had been killed on San Clemente Island during maneuvers. Flight students from the Santa Ana Army Air Base did field training here. After the war the Irvine Company leased the buildings to the Boy Scouts. Today the area is part of Irvine Regional Park. 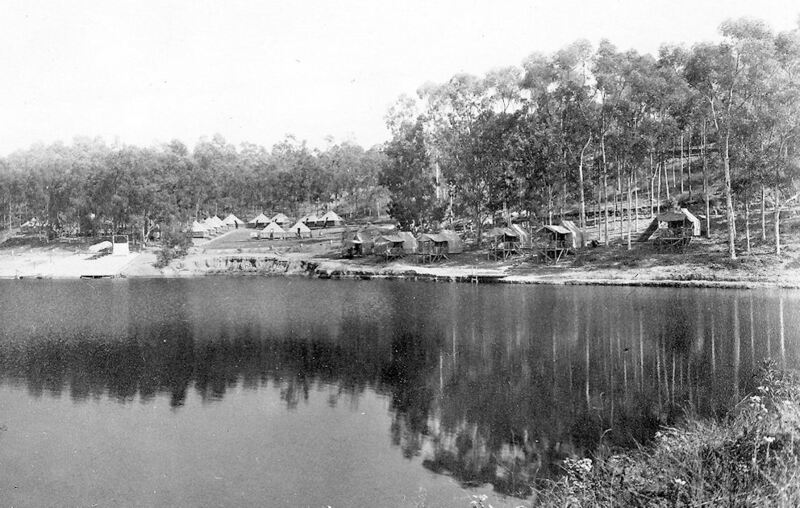 Camp Commander (Peters Canyon). An Army training base and rehabilitation camp for the Santa Ana Army Air Base, it appears to have opened in 1942. Training exercises were sometimes coordinated with Camp Rathke. The property was returned to The Irvine Company at the end of the war. Prisoner of War Camp (Garden Grove). Construction began in March 1945 on a 15-acre facility on the south side of Garden Grove Boulevard, east of Palm Street, to house German POW’s near the end of the war. Barracks and a defensive perimeter were built and the first 250 prisoners arrived in June. The men (German soldiers, not Nazi officers, the newspapers stressed) picked oranges, harvested crops, and worked at the Santa Ana Army Air Base during their confinement. Bolsa Chica Military Reservation (Huntington Beach). The government acquired some 770 acres here in May 1942, including the clubhouse of the old Bolsa Chica Gun Club, which was used for housing. This was one of a series of coastal artillery installation, with large rotating gun emplacements. Two batteries were planned here, but only one was completed. It was test-fired in October 1943. Operations were run out of Fort MacArthur and the battery here was named Battery Harry J. Harrison. The last of the military buildings here were sold as surplus in 1949. Abalone Point Fire Control Station (Crystal Cove State Park). Another link in the chain of coastal defenses stretching north and south from Fort MacArthur, the Abalone Point location (well above the actual point) was leased by the Army in April 1943. A subterranean concrete observation bunker was constructed by the Army Corps of Engineers. It was designed to prove targeting information for the (never completed) coastal guns at Bolsa Chica. The property was returned to The Irvine Company in 1948. In the first months of 1942 an Army Field Artillery Battalion was billeted (there is no other word for it) in Orange, sleeping in church halls, basements, and spare bedrooms throughout the city while being trained for overseas deployment. The Army established a line of tethered “barrage balloons” along the Orange County coast, floating at about 5,000 feet, to help protect against incoming bomber aircraft. 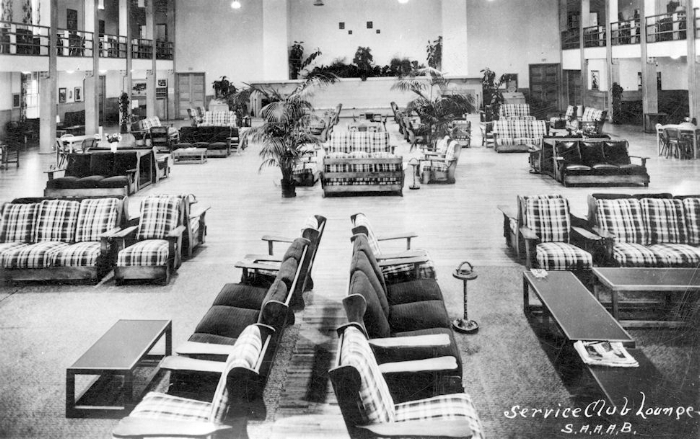 Service Club lounge at the Santa Ana Army Air Base, circa 1942 (courtesy Mark Hall-Patton). Santa Ana Army Air Base (Costa Mesa). Construction began on this 1,300-acre Army Air Force cadet training school in October 1941. Only ground training was offered here; there were no runways, and no one flew planes from the SAAAB. This was the largest local base – in terms of personnel – during the war. At its peak, over 26,000 people were stationed there, along with hundreds of civilian employees. After training more than 115,000 pilots, bombardiers, and navigators, in 1944 the base became a Personnel Distribution Center, where men and women returning from overseas were processed for discharge or reassignment. Finally, after VJ Day in 1945, the SAAAB served as a separation center, with hundreds of men and women being discharged from their each day. The base was closed in March 1946, and the buildings sold and moved away. The Army Air Force also rented the old sugar beet factory on South Main Street as a quartermaster’s warehouse. Western Flying Training Command (Santa Ana). This was the headquarters for all Army Air Force flight training at 149 installations in eleven western states. The site was acquired before the U.S. entered the war and the center operated from 1942-45. After the war the buildings were used for temporary veterans’ housing, then were taken over by the City of Santa Ana and used for many years as offices for various city programs and local non-profit groups. The last of the buildings were burned down in the 1970s as training exercises for the Santa Ana Fire Department. The Santa Ana Police Department headquarters now covers part of the site. The Army Air Force also secured use of Santa Ana Bowl for physical training for the hundreds of officers and enlisted men and women stationed here. Santa Ana Army Air Field (Orange County Airport). The Army Air Force took control of the three-month old Orange County airport right after the attack on Pearl Harbor. The Army did not actually sign a ($1-a-year) lease for the airport until December 1944, but the county did not complain as government spent a quarter million expanding the property and adding lights, a second runway, and a number of buildings. The base was also known as the Orange County Army Air Field. A small force of P-38s was stationed there for patrol missions. The county re-opened the airport in May 1946, and the property was formally returned in 1948. Inside the south blimp hangar at the old Lighter-than-Air base in Tustin, 2013. Santa Ana Naval Air Station (Tustin). Best known for its twin, 170-foot tall blimp hangars, built in 1943, during the war they housed observation blimps used to patrol coastal waters (primarily for submarines). It was commonly known as the Lighter-Than-Air or LTA base. Decommissioned in 1949, the base was reactivated in 1951 as the Santa Ana Marine Corps Air Facility. The Marines conducted helicopter flight training here. Only in later years was it known as MCAS Tustin. This 2,000-acre facility was finally closed in 1999. The blimp hangars are now listed on the National Register of Historic Places. The base was used in scenes for the 1945 Wallace Beery film “This Man’s Navy.” You can check out the preview on youtube. Los Alamitos Naval Air Station. Construction began in August 1941 and the base opened in 1942. It was originally used for flight training for Navy pilots. Today it is operated by the Army as a Joint Forces Training Base, used by the Army National Guard, the Marine Corps Reserves, and the Civil Air Patrol. Mile Square Field (Fountain Valley). Established in 1942 as one of five Naval Outlying Landing Fields connected with the Los Alamitos Naval Air Station, it was also sometimes used by pilots from El Toro and (in later years) helicopter pilots from Tustin. Today it is a county park. Haster Farm (Garden Grove). A 240-acre outlying landing field for the Los Alamitos Naval Air Station, established around 1942 north of Westminster Avenue, between Magnolia and Brookhurst. Bolsa Grande High School and Garden Grove Park cover part of the site today. Horse Farm (Garden Grove). Approximately 285 acres north of Chapman Avenue between Western and Knott. Later (1956-74) the site of a Nike missile installation. Palisades Field (Newport Beach). Established in 1942 or ’43 above the Back Bay. It was used for a few more years after the war the Santa Ana NAS. Seal Beach. The private Crawford Airport was taken over by the Navy as an outlying field around 1942-43, but used only briefly. Seal Beach Naval Ammunition and Net Depot. Plans were announced in March 1944 for a Naval ordinance depot east of Seal Beach. Over the next two years some 4,850 acres were acquired by the government. Dredging of Anaheim Bay began in March 1944, forcing the relocation of some 400 homes (including the last of the old Anaheim Landing). “The vast depot, under present plans, will cost the government about $21,000,000. Navy Engineers report the acquisition of land took an outlay of $4,000,000, and the construction cost will be in the neighborhood of $17,000,000. The installation will have one and one-fourth miles of waterfront, 35 miles of paved roads, 50 miles of railroad tracks and some 150 buildings, including barracks, magazines, storage and service structures. First buildings ready for use are concrete magazines for high explosives. Every known safety precaution has been taken. Barricades face the door of each. When needed, explosives will be taken either by truck, rail or lighter to Long Beach harbor for sea shipment…. In the gun-ammunition area are triple-arc magazines for storage of small-arms ammunition, small projectiles and pyrotechnics…. Considerable change has been made at the waterfront, where a 1200-foot dock is being built. Huge jetties have been laid to protect the harbor. The old entrance has been closed and a new 600-foot entry way is under construction. The bay itself will be 800 feet wide. At the main entrance to the depot will be 20 administration buildings, including offices, officers’ quarters, barracks for Marines and Navy enlisted personnel, a dispensary, recreation hall and auditorium. At present it is planned that the depot will require about 1700 enlisted personnel and that some 500 civilians will be employed.” (Santa Ana Register, Nov. 18, 1944). Today it is known as the Seal Beach Naval Weapons Station. El Toro Marine Corps Air Station (Irvine). Originally built on 2,300 acres of bean fields, the first men began to arrive in November 1942, flights on new runways began in January 1943, and the base was formally commissioned in March. This flight training base was one of the largest MCAS’s in United States and continued to be developed after the war. Conflicts over noise and safety began as housing moved into South County in the 1960s and the base was finally closed in 1999. In 1944, the Marines temporarily took over the Hotel Laguna for officer housing, and in 1945 they built changing huts on Main Beach for both male and female personnel stationed at El Toro. Trabuco Mesa (Rancho Santa Margarita). In 1944, the Marine Corps established an 1,800-acre bombing and gunnery range here as part of their training operations at El Toro MCAS. It continued to be used on into the 1950s. Newport Harbor was placed under military control on December 7, 1941, with restrictions on sailings in and out of the bay throughout the war. In April 1942 the Coast Guard officially established a base in Balboa (initially headquartered at the old Twin Palms Inn at Central and B Street. In 1943 actor Jimmy Cagney turned over Collins Island to the Coast Guard for a new headquarters for inspection and patrol operations. The island was returned to Cagney soon after the end of the war. In 1943 the Army stationed two boats near the mouth of Newport Harbor for emergency rescues of any plane crashes at sea. The men were quartered in the King Gillette mansion at the tip of peninsula. The Coast Guard reportedly also took over the former Crystal Cove School, which had served the children of local Japanese tenant farmers before the war. In December 1944 a Coast Guard unit took over a portion of Heisler Park in Laguna Beach. At that time the Army also had a unit stationed near Top of the World. Radio Monitoring Station (Santa Ana). A 110-acre facility near the southwest corner of Fairview and Edinger, established in 1941; its primary purpose was to listen for any radio traffic from any enemy military ships or planes off the coast. The last of the old buildings were removed in 1979 to make way for Centennial Regional Park. 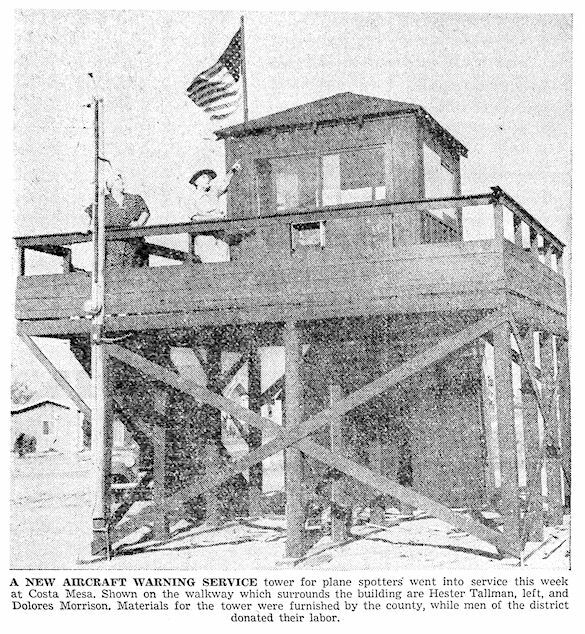 Aircraft Warning Service Ground Observation Corps (countywide). Observation posts were established throughout the county immediately after the attack on Pearl Harbor. Staffed by civilian volunteers (some 2,300 of them by mid-1943), the 20-odd posts were manned in four-hour shifts, 24 hours a day. Some volunteer observers put in thousands of hours on duty. The civilian posts were shut down in October 1943 and replaced by military personnel on the various bases around the county. Civil Defense procedures were put in place throughout the county, including occasional requirements for blackouts and dim-outs, as well as placing camouflage netting over some downtown streets. Air raid drills were also conducted from time to time. Other civilian activities included scrap drives, war bond sales, and volunteer with the Red Cross and the U.S.O. The Stearns Lease near Brea was used for training an Army Corps of Engineers unit in 1944 which specialized in oil fields operations (the unit was made up largely of men who previously worked in the old industry). Several of the civilian shipyards on Newport Harbor switched over to military construction during the war, including the South Coast Company, the Peyton Company, and the Ackerman Boat Company. By October 1944 it was estimated that some 200 military craft of all types had been built in Newport beach, including tugboats and sub-chasers. There were no large factories in Orange County during the war, but a number of smaller “feeder plants” operated here which often produced single, smaller items (like gauges or instruments) which were then shipped to factories in Los Angeles County. For more information on World War II military bases in Orange County, see Edrick J. Miller, The SAAAB Story. The History of the Santa Ana Army Air Base (Costa Mesa: The Costa Mesa Historical Society and the SAAAB Wing, 1981; second edition, 1989), which also includes information on several other bases, and Vi Smith, From Jennies to Jets. The Aviation History of Orange County (Fullerton: Sultana Press, 1974). The chapter on World War II in Leo J. Friis’ Orange County Through Four Centuries (Santa Ana: Pioneer Press, 1965) provides a good overview. 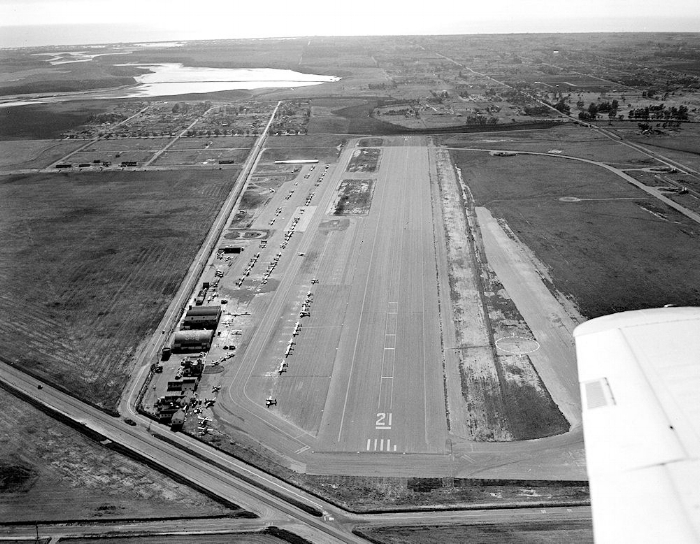 The expanded Orange County Airport after it had returned to civilian use, 1948 (courtesy the Orange County Archives).